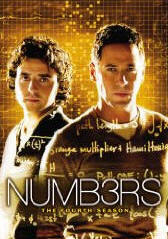 Have you watched CBS's NUMB3RS? It is usually the only television show that I try to watch each week. As the name suggests, it has a rather unique, geeky theme where two brothers, one a career FBI crime fighter and the other a mathematical genius, work to solve Federal crimes. Don Eppes is the gun-toting, head-busting leader of the team, while Charlie is a part-time consultant who divides his time between helping his brother and teaching game theory at CalSci University, where he is head of the mathematics department. Charlie is an unassuming, humble, likeable super genius who would leave Wile E. Coyote's assessment of himself wanting for equivalent intelligence and, well, wile. With the sometimes assistance of his number theory whiz student-turned-girlfriend-turned-fiancée and an increasingly eccentric astrophysics professor mentor/friend, Charlie applies sophisticated mathematical principles to crime scene details to construct "likely scenarios" that help Don and his FBI team get the bad guys. Initially skeptical of Professor Eppes' ability to use his techniques to extract information from apparently (to the FBI members) unrelated and/or insignificant data, even the most ardent Doubting Thomas quickly learns that Charlie's instincts and abilities are to be trusted. Charlie is the grade curve busting kid in high school math class that always gets the word (aka story) problems right, no matter how tough they are. Whenever Don calls Charlie in for help, he arrives on the scene with notebook computer in tow, and begins enthusiastically describing how path minimization can produce a pursuit curve to most effectively locate where a perpetrator might have been hiding during a shooting spree. Maybe he will suggest how chaos theory or fluid dynamics can be used to deconstruct a bank robbery where hostages have been taken to locate and eliminate the ring leader. FBI agents get a deer-in-the-headlights look on their faces and roll their eyes back in their heads until Charlie realizes that what is obvious to him is not so clear to everyone else in the room. Now, FBI agents are college graduates, and many have law degrees, but this level of cogitation exceeds the ability of mere mortals to fully grasp. That is the point Charlie puts on his professor's cap and starts a layman's explanation with arms waving in the air, beginning his elucidation with, "Imagine..." From there, diagrams are presented in the background that use familiar objects and physical principles to demonstrate how his brainiac mathematical model will solve their case, so everyone can live happily ever after. 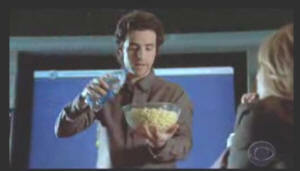 The example might be a spider determining the whereabouts of its captured prey within the large web, or maybe how searching for an occupant of a sparsely populated region of space (a bowl of fluffy popcorn) can be made simpler if some collection agent can bring all the members in closer proximity without losing any suspects (pouring water on the popcorn to reduce its volume). 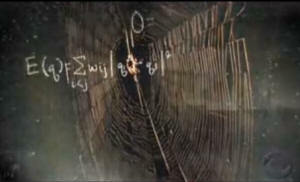 Of course, an appropriate amount of math equations with large Greek symbols, summation signs, and integral curves are superimposed on the visual props. I always thought it would be comical to produce a reverse version of the NUMB3RS theme, whereby a commoner finds the need to use the parlance of a highly educated person in order to explain a simple principle by applying complex explanations that the highbrow individual requires in order to comprehend. Dr. Kantaleaver, presiding chair of the local Mensa chapter, notices that his Lexus is producing "an aberrant audible emanation who's point of origin has been determined to be located in the engine compartment" (his words). Dr. Kantaleaver holds Ph.D.s in both mechanical engineering and materials sciences, but being a busy and important guy, does not have time to fix the problem himself, so he takes it to the dealer for repair. He had always concerned himself with the theoretical aspects of engineering, not the practical side. Besides, the lifetime warranty of his pricey SC09 convertible precluded the need to ever own a wrench, so the smiling service manager assigns Bob to drive the good professor to his university office while Larry the mechanic tends to the car. Larry quickly hones in on the problem: the water pump has failed. In less time than Dr. Kantaleaver can drink his large Cinnamon Dolce Frappuccino® Light Blended, Larry has the old unit off and the new installed. Sure it is a bit of a black eye for the water pump to fail on a Lexus so new the steer who's hide the leather seats are sewn from is still warm, but the service is good. It is time to send Bob to pick up the customer. When Dr. Kantaleaver arrives, he naturally asks Larry what had been causing the noise. "The water pump crapped out on you," replied Larry. "Water pump?" says the prof quizzically. "Yeah, the bearing got busted, so I replaced it." Realizing he was getting nowhere, our socket-spinning hero begins, "Imagine that you have a thermal mass that needs to have its temperature maintained at a level not to exceed 366 kelvins. Due to the differential coefficients of expansion of the dissimilar metal alloys that comprise the mass, higher temperatures will produces crystalline fractures and out of tolerance meshing between components in relative motion within the volume. Such incongruities inexorably result in system deterioration - often irreversible. If catastrophic failure is not experienced, then certainly metal fatigue and weakening of interface mating facilitators will precipitate premature aging in accordance with Arrhenius lifetime acceleration. Substituting the offending element with one which fully complies with the requirements specified by the designers has resolved the deficiency." A broad smile appeared across the good professor's face. "Well done," said he. Larry winked at the manager as Dr. Kantaleaver drove off, his long graying ponytail flapping in the breeze. Meanwhile, across town, neurosurgeon Dr. Broca (no relation to the famous Paul Brocha) was having problems of his own. It was not to be a good day for the Lexus brand, but that's why dealerships have service departments. In the middle of the intersection, Dr. Broca's GS Hybrid sat dead as a doornail. Neither electric motor nor internal combustion engine could be coaxed into moving the beast. It was now in its greenest possible mode of propulsion. The standard equipment OnStar system instantly placed a call to the central office, whereupon a tow truck was dispatched to the scene, and a courtesy vehicle was delivered so that Dr. Broca could complete his trip home after a full day of operating on brains. Back at the shop, our man Larry directed the tow truck to place the car in his service bay. With the aptitude that would make Mr. Goodwrench himself seethe with envy, Larry used his crack troubleshooting techniques and the diagnostic instruments to isolate the problem to the sensor connector going into the car's primary computer. A squirt of WD-40, and a couple mating/de-mating cycles later (to wipe the contacts clean), and the little eco-friendly contraption was ready to resume saving the Earth. The service manager suggest that Larry deliver the GS Hybrid to the doctor's personal residence as a gesture of quality service. He agreed. Silently pulling into the granite-paved, U-shaped driveway (the GS was in electric-only mode), Larry strode to the door. The man servant greeted Larry and told him he would find Dr. Broca in garage #4, packing the H2 for a cross-country vacation trek. Too far away to walk in short order, Larry hopped back into the hybrid and motored over to the estate garage complex. There, indeed, was Dr. Broca. "Just a moment and I will open the door on garage #2. You can pull it in there." As Larry was getting out of the car, the doctor inquired as to the cause of the malfunction. "Dirty connector," said Larry. Dr. Broca tilted his head in confusion. By now, Larry knew the drill. "Imagine," begins Larry, "that a patient presents in the ER exhibiting total lethargy of all limbs and extremities. Sufficient brain activity is occurring to maintain primordial stem functions such as heartbeat and breathing, but paralysis of voluntary motor senses are plenary. No external injuries are apparent. The 2-year-old patient has no history of brain failure. Vital signs are normal, but the patient is nonresponsive to stimulus. You wire the patient for an EEG to determine the extent of the damage. Without sufficient oxygenation brain cells begin to atrophy in mere minutes, and they do not regenerate. Time is of the essence. Fortunately, breathing is normal so oxygen depravation is not an issue, but you are trained to remember the dying brain cell thing anyway. It will come in handy another day. The EEG machine comes to life and begins displaying critical information about your patient's brain activity. Synapses are firing within the cortex, but there seems to be little activity at the spinal cord region. You immediately suspect a deficiency of enzymes that transmit bodily function signals to the neuroreceptors of a healthy brain. Remembering reading an article on the synapse facilitating enzyme Synaptojanin 1, you order a 10 cc syringe for injection at the primary motor cortex site. Stat. The ER is tense as minutes pass. Almost miraculously, your young patient springs to life and all is well again. The diagnosis was correct and the treatment successful. Your emotions swing wildly back and forth between near panic and exuberance. Today, science has won. Tomorrow will bring a new challenge. You wheel the patient out to greet her parents. In celebration, they are going on a vacation. Two happy customers in one day. Not bad. Bob had followed behind Larry to pick him up after dropping off the doctor's car, forgetting that Larry could drive the loaner back on his own. By now, though, it is 6 o'clock, so they head for the tavern. There will be some good stories to tell tonight. Copyright: Kirt Blattenberger, BSEE, UVM 1989.